Commander-in-Chief of Defence Services Senior General Min Aung Hlaing, accompanied by his wife Daw Kyu Kyu Hla, Commander-in-Chief (Navy) Admiral Tin Aung San, Commander-in-Chief (Air) General Maung Maung Kyaw, senior military officers of the Office of the Commander-in-Chief (Army), Commander of Northern Command Maj-Gen Teza Kyaw and officials, arrived in Indawgyi, Mohnyin District, Kachin State, this evening and was welcomed by local elders, local people and members of local people’s militia. The Senior General met local elders, local people and members of local people’s militia, and discussed regional development undertakings. First, local elders, local people and leaders of local people’s militia reported on matters relating to regional development and security. 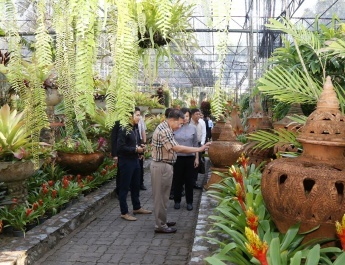 In response, the Senior General expressed pleasure to meet with the ethnic people. The Senior General said as there are differences between the regions, their requirements cannot be the same. The ethnic races should foster the spirit of Myanmar and strive for development through consolidated efforts. The people living in the Indawgyi region profess Buddhism. The Buddha taught mankind to uphold moral and to pursue a decent living. Although no one should harbour antagonism, all must harmoniously ward off any hostile attack. The Tatmadaw will coordinate with the ministry concerned for the improvement the transport sector, which is required for development. Indawgyi region has an abundant array of cultivable land, water and food supplies. 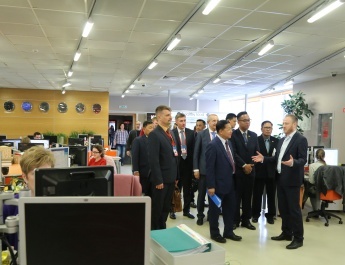 The region must produce finished farm goods by using the available electricity. People should prefer nutritious vegetables, meat, fish and eggs for health. Educated persons must be produced locally for regional development. 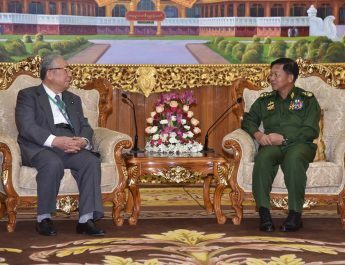 The Tatmadaw has been providing assistance for regional development to the most possible degree. Collective efforts should be made to stop drug abuse in the region. In its continuous efforts for peace in the whole country, the Tatmadaw issued a statement on 21 December 2018 for ensuring a ceasefire and eternal peace. But when a month had passed, some armed ethnic groups were found to be breaking the promises. A way has been opened for peace negotiation in accord with the NCA. The nation will develop only if there is peace. The rule of law and peace and stability are vital for the discipline-flourishing democracy system at the time the country is on the path to democracy chosen by the people. 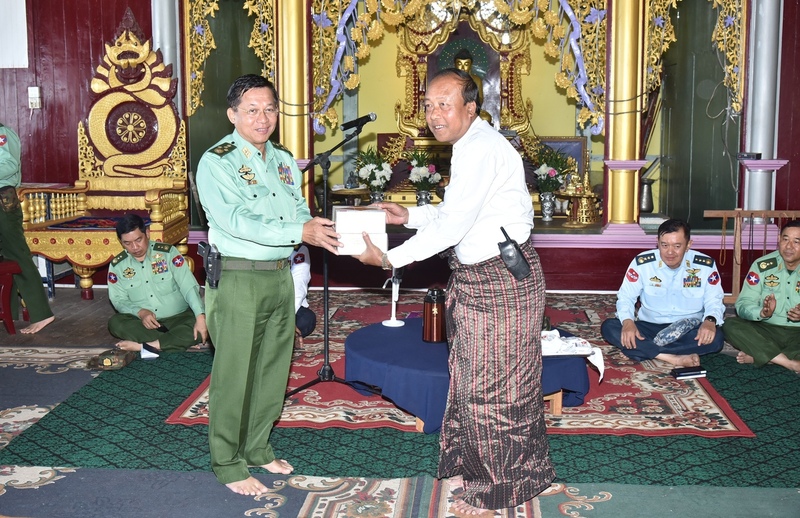 Senior General Min Aung Hlaing, the Commander-in-Chief (Navy) and the Com-mander-in-Chief (Air) presented foodstuff for local people and members of local people’s militia. Later, the Senior General and wife and party paid obeisance to Shwemyintzu Pago-da on Indawgyi Lake, and offered flowers, water and oil lights. 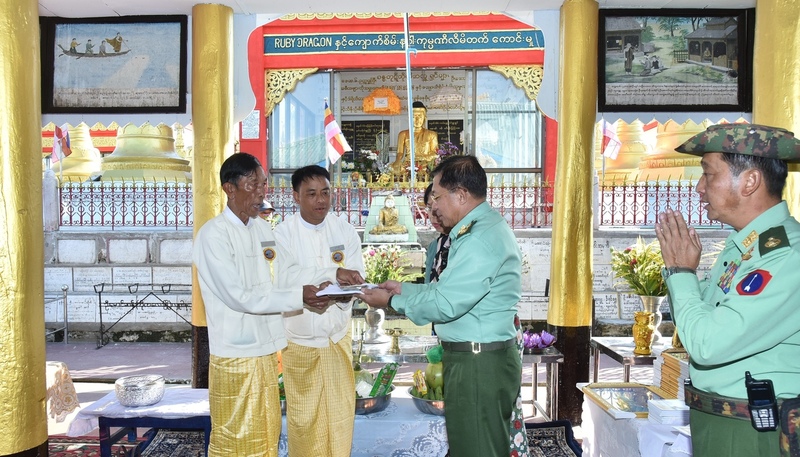 The Senior General and wife presented cash donation for general renovation of the pagoda through the Pagoda Board of Trustees, which in turn presented the photo of the pagoda and the book on the pagoda history to them as a Dhamma gift. 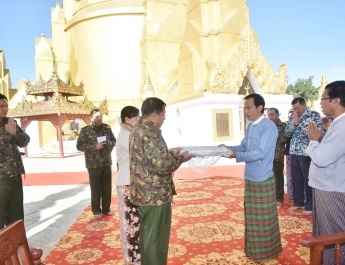 The Senior General and party paid homage to the pagoda clock-wise, and discussed the pagoda renovation task and the assistance to be provided by the Tat-madaw with members of the Pagoda Board of Trustees. Afterwards, the Senior General and party arrived at Yahanda Tahtaung Shinpin Myatswa Hsutaungpyae Pagoda on Shwemoe Hill, Mainar Village, Waingmaw Township in the evening. 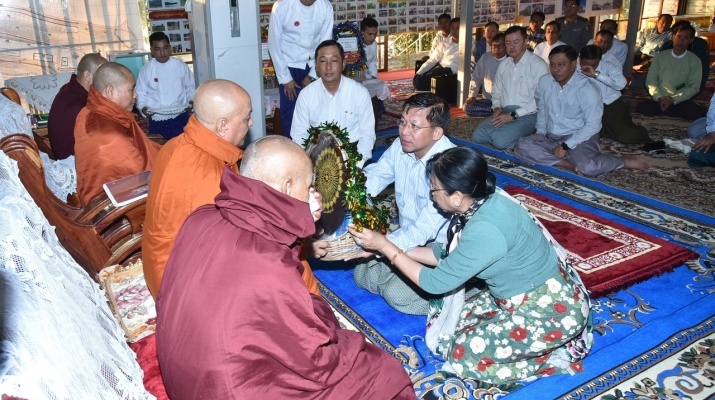 They paid homage to members of the Sangha led by Secretary of Kachin State Sangha Nayaka Committee Sayadaw of Dhamma Rekkhitawuntho monastery in Myitkyina Sayadaw Agga Maha Pandita Bhaddanta Ketumala, received the Five Precepts and presented offertories to the monks at Shwe-moetaung Dhammayon. The Senior General and wife then presented flowers, water and oil lights to the Buddha Image of the pagoda. The Senior General and party went round the pagoda clock-wise.